Marvel legends Gremlin action figure. Adult-Owned, Figures is in good condition . Everything is as seen on the picture. Ask questions if you need information before bidding. If you need additional pictures, please ask promptly. All sales are final and I do not offer refunds therefore what you see is what you get. Items will be properly packaged. Once the item is shipped with the US Postal Service a tracking number will be provided. Seller is not responsible for any damage to the item while in route items must be paid for within 24 hours of winning the auction. This is asuper rare item very hard to find. 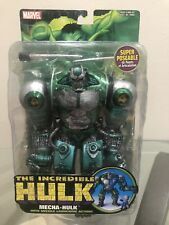 Brand New Marvel Legends Mecha Hulk figure. Made by Toy Biz. This figure is long out of production and extremely rare. Will be shipped securely in a box with extra bubblewrap. Please message me with any questions. Thank you! ~What you see what you get in the picture.